There were a few places on the walls down the corridor that were blank, except for dark rectangles, where paintings formerly hung but seemed to have been taken down. As they approached the end of the hall, next to one of the dark spots was a portrait of... Hillary Prima. The very first Hillary Rodham Clinton, though in this portrait was a good deal older than her current incarnation. Hillary the Ghola stopped. The God Emperor apparently knew she was going to stop, because He too halted in front of the painting simultaneously, without even checking to see whether or not she did. She was puzzled. "How many of me have there been?" "More than you need to know." "Why do you keep reviving me?" "You amuse me, and after this HYUUUGE number of years, the BILLIONS of wealth that I possess, and the number of BYOOOOOTIFUL women I married, very few things amuse me anymore." "Why didn't you clone Jeb or Carly? Why me?" "Listen, I knew those people. I met those people. Those were nice people, and I enjoyed talking to them very much. But they were losers, and they sucked." Quietly she contemplated this, then continued on. Soon she heard a crowd, a very sizable one. The hall opened up to a dais in a gigantic ceremonial chamber, and indeed, there was an innumerable audience. As they entered, there was voluminous cheering, which died down to low, happy mumbling. Three Duck-Speakers were kneeling in front of the dais with their hands tied behind their backs. The worm's voice boomed out over the crowd. "BEHOLD, THE TRAITORS!" Loud booing and hissing followed, then relative quiet again. "THEY ARE FEMMANEESTS! THEY WILL RECEIVE JUST PUNISHMENT!" The dozen or so Duck-Speakers who were guarding the worm efficiently set up a row of fancy chairs. Three men dressed in uniforms marched to the chairs and saluted the God Emperor. The kneeling traitors began looking nervous, panicked. They sat down in an almost inhumanly straight fashion. At that moment, the men's legs spread apart. The traitors, who were watching the men and getting angrier and angrier, started trembling and convulsing. Choking and coughing fits overtook them. "THEY ARE... LITERALLY SHAKING! BREATHING? THEY... CAN'T... EVEN!" Two of the traitorous Duck-Speakers fell to the floor, motionless. The remaining one somehow slipped from her bonds during her trembling rage. She pulled a transparent pistol from a hiding place in her boot. "Water pistol! Water pistol!" gasped the crowd in surprise. The clear stream was aimed dead at the worm. He slid his enormous body away just in time to dodge it. The guards grabbed the pistol wielder and forced her to sit next to one of the men, whose leg brushed gently against hers. Her head nearly exploded and she fell dead, like her companions. "ALL HAIL THE NIMBLE NAVIGATOR! WE ARE HIS CENTIPEDES!" While Hillary watched, they dropped down and crawled on their hands and knees, like so many fleshy insects. The God Emperor boomed, "THUS ENDS THE CEREMONY!" 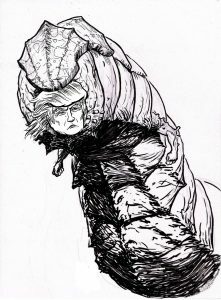 Hillary the Ghola and the God Emperor exited and started their way back down the curved corridor. Hillary stopped at her portrait again. "There seems to be a painting missing here next to mine. Who is it?" The worm did his puckered-lip duck-smirk. He yelled for the guards to get "the painting". They almost instantly came back with a portrait, as if they knew exactly the one to get before she even stopped. Two of them put it on the wall next to hers. "DAMN YOU BILL! DAAAAAAAAMN YOOOOOOOOOOU!!" The worm kept smirking. "All the Hillarys say that when they wake up."